Dalla cucina v'è un'uscita diretta ad una veranda semi-coperta e ampio giardino. Due tavoli da giardino con 8 posti a sedere vi invitano a rimanere o mangiare. Barbecue e ombrellone completano il quadro. Immediatamente prima che la casa è il parcheggio per gli ospiti. Il bagno ha una vasca da bagno, dove puoi comodamente fare una doccia semplicemente comodo. Il bagno è nel bagno. Basi sufficienti e un rack offrono spazio per attrezzature personali. The property was very well maintained, clean with enough space for our family of four. The house was perfect for our family of four! Steffie was a wonderful host and was there to greet us upon our arrival. We were grateful for her advice and all the information she was able to provide for our trip to Lucerne. The house is located in a quiet part of town but only a 5 minute walk to the bus stop. So convenient! We enjoyed the scenery that surrounds the property - beautiful trees and flowers and loved saying hello to the goats. What an overall wonderful and delightful experience we had during our stay there! Very nice apartment with plenty of space for family of 4. 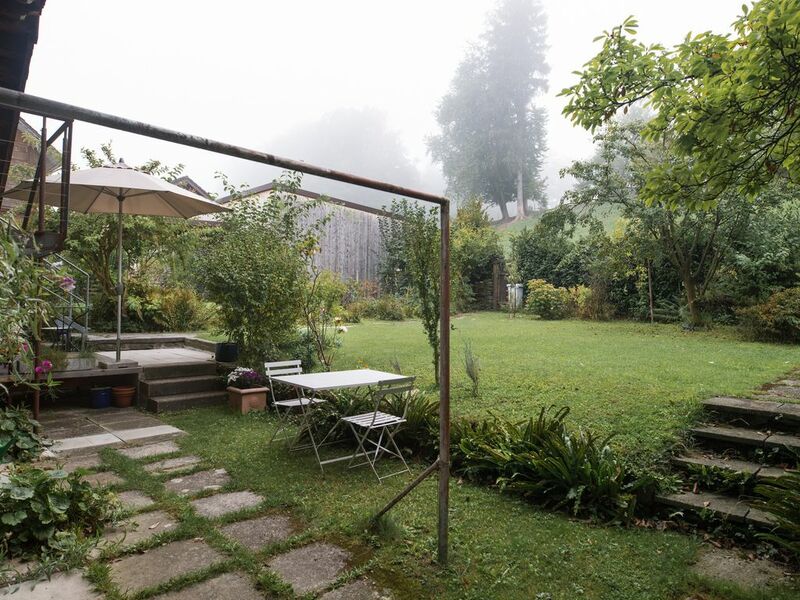 Well equipped kitchen, use of garden space and location close to Lucerne make it an ideal spot to explore the area and have a comfortable space to come back to. Many thanks for your visit and I hope you will come back! Great guests! Wonderful host, location and apartment. We very much enjoyed our stay with Steffie and will be recommending it to friends. Lucerne is an absolute gem of a city. The apartment location is just a few kilometers from downtown but located in a quiet area. An easy drive or bus ride. My daughter loves animals and was delighted with the neighbor's goats and rabbits (don't worry, they are quiet). The apartment sparkles and has everything you need. The location is also close to several markets (Coop, Aldi and Lidl) for supplies. It was a big pleasure to host you! If ever you come back you are very welcome! I hope to see you soon! We loved staying here! It was even better than the pictures. It’s a traditional chalet with a renovated interior. Very comfortable with a quiet location just outside of town. Lucerne is fairy small, so if you get a bus pass it’s only a few minutes to get into the city. I would highly recommend staying here, and the hostess, Steffie, was very kind to us. Die Wohnung ist sehr stilvoll und liebevoll eingerichtet. Die Besitzerin kümmert sich mit viel Herzblut um das Wohl ihrer Gäste. Das Wetter war perfekt. Gerne komme ich wieder. Ich danke Ihnen für Ihren Besuch! Und freue mich sehr auf das nächste Mal! - The Blue Festival Blue Balls si svolge in ogni caso nel corso di una intera settimana in estate. Il mercato settimanale sulla Reuss il Martedì e Sabato mattina è uno dei più belli della Svizzera. una fine incontaminata doganale dell'inverno (in ogni caso dal Giovedi sporco al Mercoledì delle Ceneri nel mese di febbraio). Il lago ha grandi e belle crociere in battello a vapore, durante i quali è possibile soddisfare piacevole godendo la magia del paesaggio. Sci: Da Lucerna / Ebikon dalle località sciistiche nel giro di un'ora sono facilmente accessibili. L'attrezzatura da sci può essere affittato a Lucerna o direttamente nelle località sciistiche.